CCC's Mario Kart Wii Launch Site: Reviews, Previews, Cheats, Videos, Screenshots, and more! 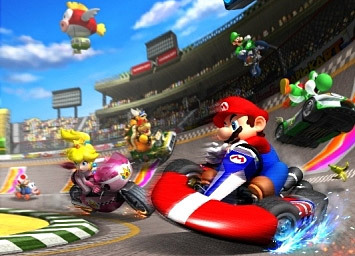 Find all the info about Mario Kart Wii: cool videos, articles, etc. What are you waiting for? Scroll down! 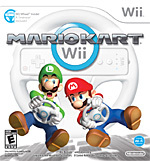 Mario Kart Wii will be launched with the Wii Wheel, which will allow gamers to get right into the action with ease. The game includes all-new vehicles, including motorcycles. Characters will perform tricks, stunts, and jumps! Nintendo is proud to offer online gameplay through Nintendo WI-FI. Compete against your friends and other people from all over the world! Ready to get the most out of Mario Kart Wii? Don't forget to check out our cheats section, where you'll find cheats, tricks, hints, and everything you need to know about secrets and unlockables included in the game. Keep checking back for more!